The Zebra Puzzle is a logic puzzle that relies heavily on deduction, so much so that it can be a big challenge to those not used to having to think this way. It's supposed to be a very difficult puzzle, some claim only 2% of all people can solve it. Since I managed to solve it I find this hard to believe, especially since this puzzle relies a lot on simply eliminating possibilities, rather than having to figure out a solution. 1. There are five colored houses. 2. The white-haired girl lives in the red house. 3. The black-haired girl worships the Fire god. 4. The person fighting with a bow lives in the green house. 5. The redhead fights with a scimitar. 7. The person of house Bear worships the Moon god. 8. The person of house Dragon lives in the yellow house. 9. Daggers are used by the person in the middle house. 10. The blonde lives in the first house. 11. The person of house Badger lives in the house next to the person who worships the Rising Sun god. 12. The person of house Dragon lives in the house next to the person who worships the Star god. 13. The person of house Lion fights with an axe. 14. The brunette belongs to house Stag. 15. The blonde lives next to the blue house. So, who fights with swords, and who worships the Barren Tree god? We know there are five sets of five. Five people, five colored houses, five gods, five weapons, and five noble houses. Plus we know some of the definite combinations based on the 15 pieces of information we've been given. Before I reveal how to solve this puzzle I'll give you a tip to figure everything out on your own: Writing everything down can help tremendously. Having a visual representation of all the possibilities greatly aids the elimination process. So, as you can see in the image above I've compiled all the information we know from the 15 points. That was step 1. Step 2 is using those pieces to first conclude the most obvious answers. 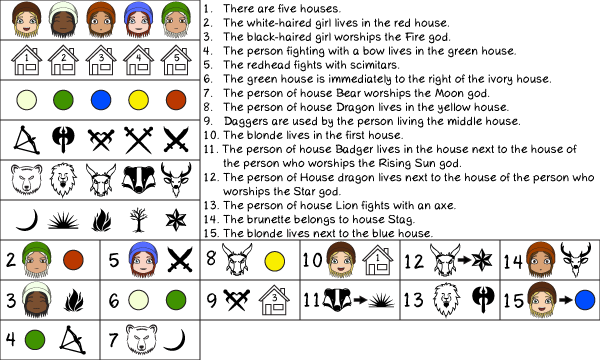 We know from 10 that the blonde lives in the first house, and we know from 15 that the blonde lives next to the blue house. Therefore house 2 must be blue. On a side note, let's say you pick the right house as the first house instead of the left house, this doesn't change whether the puzzle can still be solved, it merely changes the order of things. We also know the white-hair girl lives in the red house, we know green and ivory are next to each other, and since the first house is next to the blue it therefore cannot possibly be green or ivory. Only one color remains: yellow. This also means, according to 8, that the blonde belongs to house Dragon, and thanks to 12 we know house 2 must therefore be a Star god worshipper. 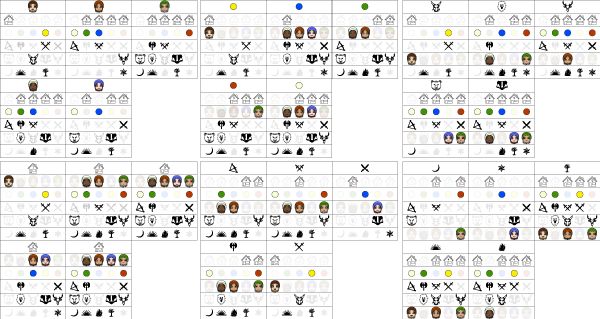 Furthermore, a bow is used in the green house, the redhead uses a scimitar, the middle house uses daggers (point 9), and house Lion fights with an axe. So swords must be used in house 1 by the blonde. So we've figured out a lot already, but this is where things get trickier and more time consuming. I found it easiest to first scratch out all the impossibilities, and then focus on the elements which had only 2 options left. For example, at this point the second house can only have either the redhead or the brunette, because 2 says the white-haired girl lives in the red house, and 3 says the black-haired girl worships the fire god (we know house 2 is a Star god worshipped as shown earlier). You can make many of these simply deductions, and finding them all will help you with figuring out the final pieces. As mentioned before it can help to make a visual representation of this, then use that to continue crossing out all the impossibilities, like in the image below. Once you've figured out the easy deductions all there's left are the cross referencing deductions. For example, since green has to be to the right of ivory it can never be in the middle, and this also means house 4 cannot possibly be red. 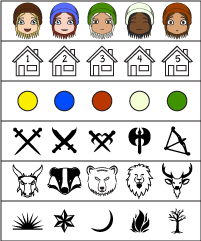 Furthermore, since house 2 can only have the brunette or the redhead, as shown earlier, and since it can also only have a person with scimitars or an axe (daggers belongs to the middle house as dictated by point 9, we found out swords belong to house 1, and the bow belongs to green), we can conclude the redhead must live here, as she uses scimitars. Why? Because the brunette can only possibly have the daggers or the bow, so she can never live in house 2. To those wondering why the brunette could only have either the daggers or the bow: We know the swords belong to the blonde, the scimitars belong to the redhead (point 5), and the axe belongs to house Lion. The brunette belongs to house Stag, as stated by point 14. - Blonde, house 1, yellow, swords, Dragon, Rising Sun. - Redhead, house 2, blue, scimitars, Badger, Star. - White-haired, house 3, red, daggers, Bear, Moon. - Black-haired, house 4, ivory, axe, Lion, Fire. - Brunette, house 5, green, bow, Stag, Barren Tree.